I spent much of my life traveling in the developing world working on education projects, visiting many of the most remote countries on the planet. Yet, on checking into a hotel in La Paz or Sana’a or Port au Prince, I would always find spaghetti Bolognese on the menu. This may well be one of the most ubiquitous dishes in the world, although some of the versions that you find bear little resemblance to the real classic dish. While I can perhaps forgive the chef in Riyadh for not getting it right, I must say that I am sometimes aghast at some of the versions that are suggested in the good old USA – “quick Bolognese” being the most egregious. While I can think of some things that are quick and still good, Bolognese sauce is not one of them. This is a truly classic dish and needs to cook all day long. The word “Bolognese” means “from Bologna”, that great city in northern Italy, that some say is one of the culinary centers of the world. Written evidence of the recipe goes back to the fifth century, although tomatoes weren’t added until the 16th century. (http://www.gather.com). 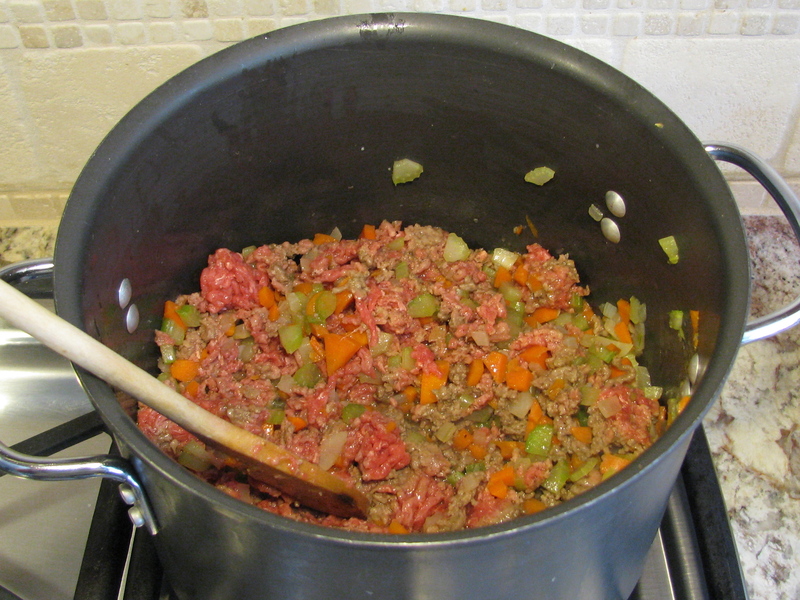 To make a true Bolognese sauce, you need to start before noon. It will take you about 15 minutes to chop and prepare the ingredients. It takes another 15 minutes to sauté the onions, celery and carrots and to brown the meat. Then, it takes another 45 minutes to reduce the wine and the milk. So, you have a little over an hour of active cooking. The next step is to add the tomatoes and gently simmer the sauce 3-6 hours, all the while filling the house with a great aroma. Tech Notes: Layering: This recipe will introduce you to layering, where ingredients are added one at a time and allowed to cook in a specific and controlled way. My friend, Bob, once watched me make this dish and asked why I didn’t just throw everything in the pot at once and be done with it. There is little hope for Bob understanding anything unless there is some sexual innuendo, so I asked him if he understood the word “foreplay”, and a light, albeit dim, went on. In more culinary terms, here’s why we take our time and “layer”. In cooking there are many chemical reactions taking place, all producing complex organic molecules that have specific “taste” to the human palate. If you are allowing too many reactions to take place at the same time, you will not get some of the desired results. For example, we start this dish (and many dishes) by sautéing onions so that they caramelize and develop a sweet nutty flavor. If we just throw all the ingredients in the pot at the same time, the onions will not caramelize and this flavor layer will be lost. Next we add the carrots and celery and allow them to cook only with the caramelized onions. After three or four minutes you will distinctly smell the flavors of the celery and carrot “release”. Again, if we had put all of the rest of the ingredients in at once, this flavor layer would also have been lost. Reduction – the process of boiling away water and alcohol – is another way to create a layer of flavor through concentration. In this dish, after we brown the meat, we add the white wine, which we allow to completely bubble away. The white wine deglazes the pan and helps incorporate the meat flavor. As the water and alcohol in the wine bubble away, the meat and the vegetables are coated with an intense white wine reduction. Milk is then added and the reduction process repeated. Now everything has a rich coating of milk solids. Finally, we add the tomatoes in their juice, lower the heat and simmer for three or four hours, letting all of flavors become more intense as the sauce slowly reduces more. The end result is a sauce with very little liquid but very intense flavors. I like to make fairly large batches of Bolognese sauce. The recipe below will make enough for two pounds of pasta. If you want to double the recipe, do it in two pots – it seems to work better. The sauce keeps well for at least a week in the fridge and for 3-4 months in the freezer. I use two freezing techniques. The first is to put two cups of sauce in a zip-lock bag. That is a good amount for a pound of pasta. For a quick meal, defrost the bag of sauce in a bowl of hot water and warm it on the stove while you are cooking the pasta. I also like to freeze the sauce in ice cube trays. This allows you to make even smaller servings. Keep some cooked pasta in the refrigerator and you have the makings of some great snacks for kids. Marcella Hazan in her great book, “The Essentials of Classic Italian Cooking”, points out that the British, who have possibly be the greatest proselytizers of this dish, almost always serve it over spaghetti, while the Italians never do. It is usually served over wide noodles like pappardelle or tagliatelle, or over shapes like conchiglioni (shells), farfalle (bow ties) or rigatoni (tubes) because these pastas better catch and hold the sauce. I agree with Marcella. Time Required: 1 hour and 15 minutes of active cooking; 3-6 hours of simmering. 1. Heat the vegetable oil and butter over medium high heat. Add the onions and sauté until translucent – about 5 minutes. 2. Add the celery and carrots and sauté for another five minutes. 3. Break up the meat into small pieces and brown, adding the salt at the same time. This will take another 5 minutes. 4. Add the wine, leaving the heat on medium high and reduce until almost completely gone – about 10-15 minutes. 5. Add the milk and also reduce until almost completely gone – about 15 minutes. 6. Stir in the nutmeg. 7. While still in the can, cut the tomatoes as best you can with a table knife and add to the sauce. Include all of the juice. 8. Bring the sauce to a boil and then reduce the heat to the least possible simmer. Cook for 3-6 hours, adding water if it becomes too dry. 9. Prepare the pasta, toss in a large mixing bowl with two cups of the sauce and serve. The grated Parmesan can be added at the table. 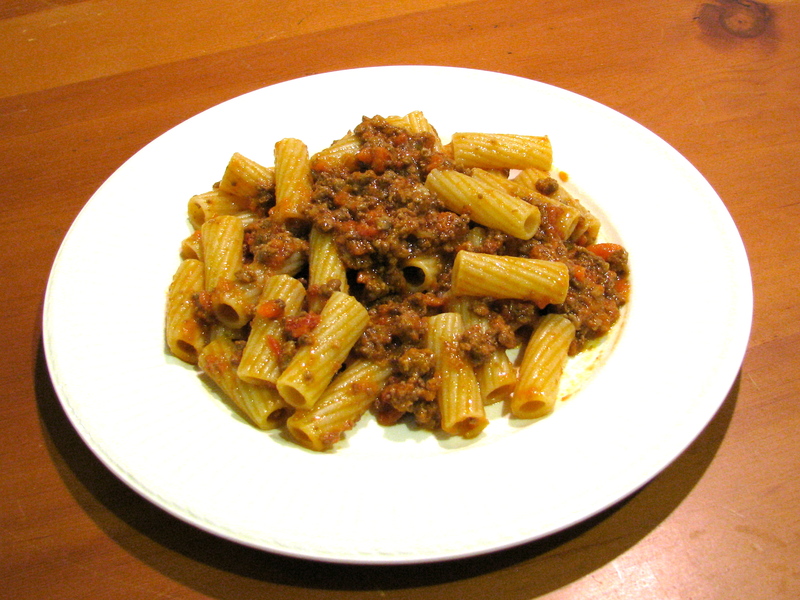 There are a few variations of Bolognese sauce in Italy. 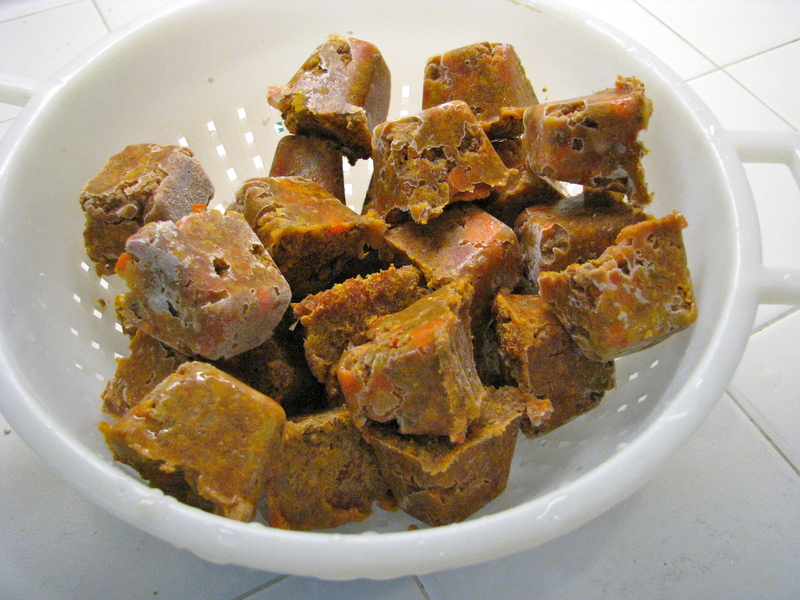 Some recipes use a combination of ground meats – veal, pork and beef. Sometimes, some pancetta is added. The most traditional is the one shown above with ground chuck. 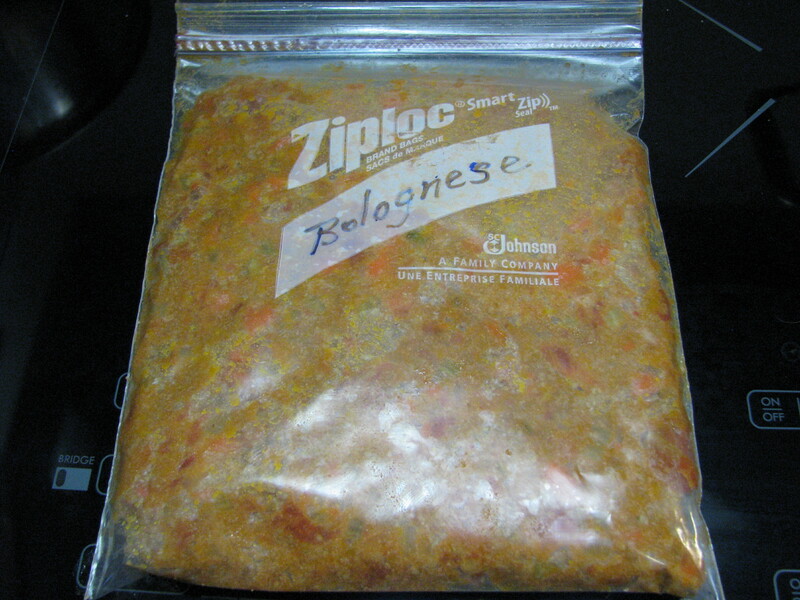 A friend made a gourmet “white Bolognese”, using ground turkey for the meat and substituting diced parsnips for the tomatoes. Otherwise, the cooking technique was the same and it was very good. I had not thought about it until you mentioned it, but during my international travels I too found some comfort in seeing the familiar dish of spaghetti Bolognese on hotel menus, especially when none of the local items on the menu sounded good. Great recipe. Can’t wait to make this! Interesting info on the layering. We are in Italy at the moment in Umbria. Hoping to get some new ideas. This is the region of truffles so I’m excited. Good luck with the Bolognese sauce.